The keyword builder tool is directly linked to Competition Analysis features. You can see which keywords attract top competitors and you can review their websites to see how they are using those keywords. As a result you can carefully select your appropriate keywords to create your article/blog posts, once you understand what your competitors are doing. 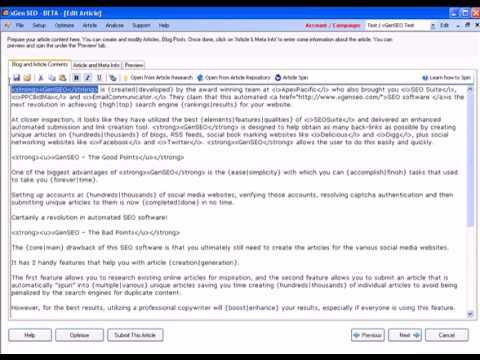 This tool will help you to easily create articles and blog posts. With its clean and easy to use interface, you can create context rich articles through bold and italic formatting, plus add hyperlinks within your article. Valuable meta information you can enter include Article Title, keywords, Abstract and the Author information. All this information will be used automatically by XGenSEOT, when it submits your article/blog posts to all the major social media sites at a click of a button! Create a new Yahoo email account at the click of a button! No completing of captcha field because the intelligence of XGenSEOT resolves it automatically! This amazing tool helps you to create 100s of new email accounts at the click of a few buttons. If you prefer to use your existing POP3 email accounts, they can be used too. Heard of creating 100+ accounts at the top social media sites in less then 20 minutes? Now you can do that with XGenSEOT! Simply select the social media sites you would like from 100+ options and then click one button to create all the accounts. Yes, it is as easy as that! XGenSEOT will go to each of the social media sites, it will create accounts and it will even resolve captcha on all those accounts automatically! Once all these accounts are created, it will go to your email account, open all those 100s of emails and automatically verify each of the social media accounts from the links! No manual process involved here! At the click of a button, this powerful tool will automatically submit different and unique versions of your article to 100+ social media sites! This amazing tool automatically logs you into each of the social media sites, posts your article, enters the article title, keywords, abstract of the article and the author information. It will then go to the next site and repeat the process! You save massive amounts of time and get hundreds of quality back links to your website! XGenSEO ™ - the next generation SEO Social Marketing Software . Drive heaps of Web Traffic to your website when XGenSEO™ increases your Search Engine Ranking position by automatically generating 1000's of quality back links from popular Social Media sites. This is an essential social media SEO marketing tool to help you generate quality back links from all the major social media sites under one simple interface.